On December 14th, 2010 Park Place Chapter of Hadassah, Pembroke Pines Florida- invited Shaikh Shafayat to lecture to a group of Jews and Christians. It was a great success! 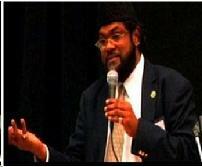 The Shaikh spoke about good relationship to better understand faith and culture. He also spoke about different aspects in the religion of Islam such as Prophet Muhammad (S.A.W), festivals, holidays and the Qur’aan. The audience benefitted a lot from the Shaikh’s message. There was also a question and answer session. 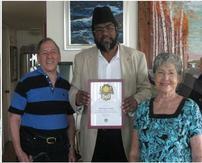 The Shaikh was given an award for his wonderful and inspiring lecture from the members of the Hadassah Study Session. 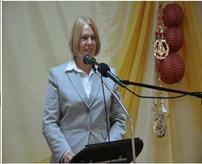 The Interfaith Council of South Florida held their Sisterhood Brotherhood Annual Dinner at Darul Uloom Auditorium, Pembroke Pines, Florida U.S.A. on Sunday February 27th, 2011. The audience enjoyed the dynamic lecture by Dr. Mary Carter Waren of St. Thomas University, Miami Florida U.S.A.
Interfaith Dialogue on War at Congregation L'Dor Va-Dor in Lake Worth, Florida. 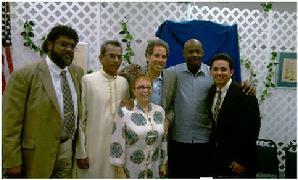 The dialogue included many speakers from different faiths all over Florida. Photo Above: Audience listening attentively to the Dialogue on War from the panelists.